Integrated communications is the concept of making all methods of marketing work in unison across all aspects of an organisation’s activities, rather than in isolation. Well, when I wrote a CharityComms’ best practice guide to integrated communications with my colleague Sarah Myers, we found that many organisations are already on their way to this ideal. Sarah and I interviewed heads of brand, fundraising and communications to build up a picture of how integrated communications work. We then broke this down into case studies, top tips and concrete advice, writing a 56-page report for CharityComms, the membership network for communications professionals working in UK charities. 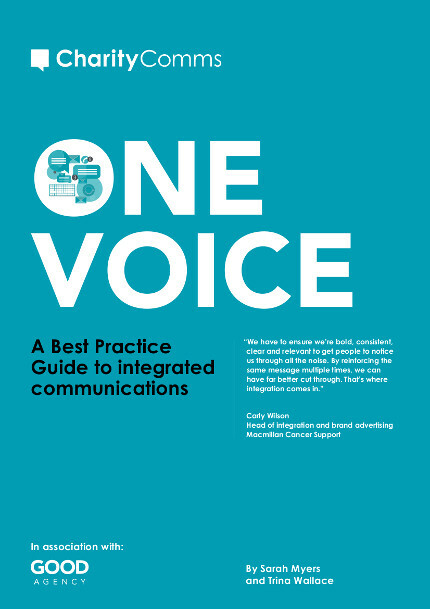 Content in the report, called One Voice, has formed the basis of two CharityComms conferences on integrated communications and is guiding charities to be more consistent, bold and united.